Hello guys, this is the Allengator here and this is a blog where I am specifically going to hopefully entertain and inform people about the joys and perils of anime-dom. Normally, I would start a post about my own personal life, but I am going to keep this purely on a professional/fan-atic level, so I will just be talking about my thoughts, opinions, and blabberings about anime in general. If you are interested, I do keep a blog at LiveJournal that has older anime and more personal entries. I should get back to that one day. In the future I will go into more detail about my anime obsession, but for now you will get the condensed version. I am a relative youngster to the anime world. The first show I really saw that I would consider to be an anime would be Digimon. Thanks to a lack of cable/satellite/internet in my household, I didn’t get much more anime then that and the Pokemon VHS tapes I bought for $10. After a couple years, I stopped watching these and got more involved with the “real world” and didn’t watch anything even animation-related save for Sonic X. I know the show isn’t received well but I grew up with Sonic cartoons so I make no apologies. This...is not anime, but it is epic nonetheless! I actually bashed anime for a while, ignorantly calling it an art style meant only for little kids or pervy adults. I don’t know what really changed my mind. It may have had something to do with the epic Nintendo DS game called “Elite Beat Agents”. For those who are not familiar, it is a rhythm game with some manga-eque storytelling. I loved the game so much I decided to import Osu Tatakae Ouendan and its sequel. After this I decided to give anime one more shot. On my blog I mentioned that one of the things that is popular out of Japan is anime and I posted an anime clip from Youtube featuring hilarious moments from shows. After screening it a few times, I decided to give one of the shows on there a shot. 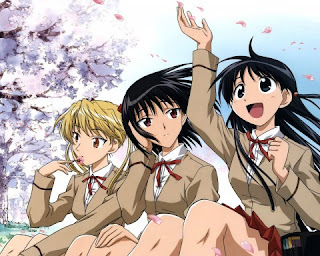 That anime was School Rumble and it shattered my past feelings about anime to oblivion. 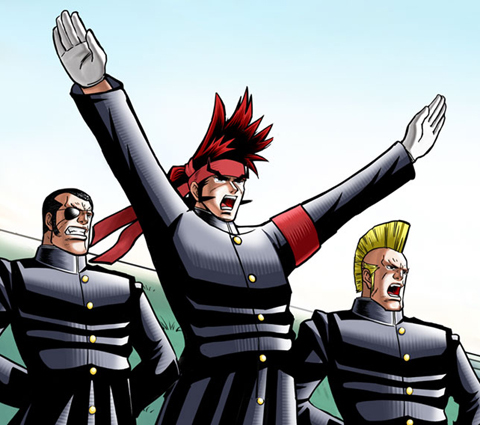 To this day that particular anime holds a special place in my fandom. Sadly, though, the year was 2008 and a lot of other shows have come before that I missed. On top of that, a lot of great shows were being imported so I got both carried away and overwhelmed at all the series at my disposal. Now I’m host to about 60 different series and still seem to be collecting more. I am not collecting as fast as I used to, but I am still collecting nonetheless. My preferred anime is neither overly meant for kids and not for adults. I like the ones that are inbetween those two extremes. As far as genre-specific goes, I tend to lean more towards comedy, slice-of-life, and romance ones that may or may not have a twinge of sci-fi in them. I never have cared for the whole mecha-destroy-the-universe-type of series. 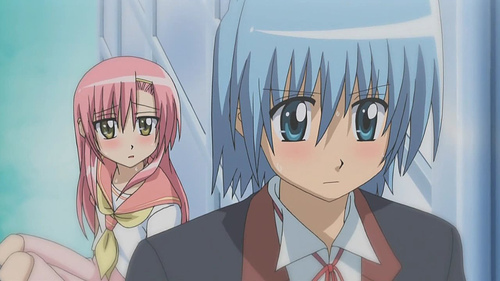 I also prefer English Dubbed anime instead of Subbed, but I am not above watching Subbed if I am forced to (Do NOT get me started about Hayate the Combat Butler). I also enjoy more modern series than the older series, especially in art style. So bitter. So so so so bitter. Now for this blog. What is it going to do? What are we going to talk about? Well, whatever I feel like it. Like any blog, I need feedback to both help motivate me and give me ideas for posts. I am going to keep track of what I watch every week, any news I feel is worth mentioning, review titles (I have some posted on my old blog, but I am going to redo them as a second opinion), and post some thought questions. Please comment. I would love to hear from you guys and I thrive on community involvement. I don’t just want this to be my blog, but have a small, if not large, community of friends and like-minded enthusiasts. Here is what I am planning. I am going to do my best to do at least one post per week, possibly up to three a week depending on my schedule and so forth. My current job and circumstances make it hard to commit to a set schedule, but hopefully soon I will settle in to a nice blogging routine on here and be able to send you guys fairly scheduled content. I hope my enthusiasm for anime (and sometimes manga) shows forth on here and I hope to have some nice discussion and debate from you guys. Again, this will thrive, but it requires more then just myself posting. No comment is dumb (Unless you’re a bot, in which case I will infect you with a virus so bad that it will make all computers in a 10 mile radius sick). So drop me a like to say “hi”, or “nice post”, or “work on your grammar!”. So until later, I hope you have a nice day and please come back! I will be posting on here soon with a new review of a series that hasn’t been released yet!